Keith Hentel, MD, likes to tell this story: A young boy fell out of a third-story window and was taken to NewYork-Presbyterian Hospital/Weill Cornell Medical Center’s emergency department for treatment. Hentel was the radiologist on call. The emergency physicians wanted a CT scan to determine whether the child had internal injuries. The child’s parents refused the CT because they were afraid of the radiation exposure. “Fortunately, as a radiologist, I was at the scanner and was able to explain to them the risk vs. benefit,” Hentel recalls. As it turned out, the CT scan showed the child had serious internal injuries and required immediate surgery. According to Hentel, this story is a good example of the fear media headlines have instilled in the public regarding radiation exposure from diagnostic imaging. Partly in response to the growing public awareness and partly of their own volition, imaging professionals have shifted their thinking about image quality and dose. For many radiology departments, the goal is no longer the prettiest picture possible but the highest quality image with the lowest dose that still can answer the clinical question being asked. Technology is making it possible to do X-ray, CT, and nuclear medicine studies with less radiation. Newer CT scanners make it easier to customize radiation dose according to a patient’s age, weight, medical condition, and the body part being scanned. But unless the imaging department has a “dose reduction culture,” this won’t happen, radiologists leading the way agree. So what does it take to implement such a culture in an imaging department and to get everyone from the radiologists and technologists to the ordering physicians and their patients to buy in? It takes leadership, time, education, and persistence, according to Hentel and others at radiology departments where low-dose imaging is an integral part of the practice culture. “Having a radiologist who is an advocate for low-dose imaging and who speaks to other physicians about it helps,” adds David Poston, RT(R), RDMS, director of radiology at McLeod Regional Medical Center in Florence, South Carolina. Without a champion, it can be difficult to maintain momentum, Hentel notes. Inevitably, some people will lose interest, and others will be slow to accept change. Having a champion will help sustain everyone’s interest, he says. Also, he adds, having a leader of the radiology practice on the team and visibly involved helps convey the importance of the practice’s dose reduction efforts. The next step is to track data. Without tracking, it’s easy to lose sight of the goal of implementing the ALARA principle: as low as reasonably achievable, Hentel says, who illustrates his point with this story: His department had purchased a low-dose iterative reconstruction package for its GE CT scanner. “When we first got it, we were all excited about it,” he recalls. About nine months later, the imaging department wanted to purchase a second scanner with a low-dose technology package. Hentel decided he would compile the numbers to show the board of overseers the savings they were seeing from using the machine and the low-dose technology. To his surprise, when he looked at the data, he couldn’t find any dose savings. As a result of Hentel’s finding, the department implemented dose-tracking software and has been able to show lower-dose utilization since. Another part of the process of creating a low-dose culture is empowering staff, Hentel says. At Weill Cornell, the lead technologists are responsible for implementing low-dose protocols. “We empowered some of our lead technologists to set the parameters so that physicians weren’t going in and changing or modifying them,” he explains. If a physician wants to change a protocol, either Hentel or a lead technologist must unlock the settings. While the settings are locked, they are reviewed regularly to confirm they are up-to-date and at the lowest possible dose capable of obtaining diagnostic-quality images. The vendors’ application specialists assist with the review. “It’s a lot of work to review every single protocol we have on every one of our machines,” Hentel says, but it’s a necessary part of the program for it to be successful. Ciancibello, whose health system uses a mix of Philips and Siemens scanners in its dose reduction strategies, says some technologists can be confused when they see the image quality change. “They may think they’re doing something wrong, and that they’re not doing right by the patient. When they don’t understand what’s happening, they begin to question, and things can snowball out of control that way.” That’s why it’s critical to explain to technologists why they have been told to use the parameters and body shields they have and that changes in image quality are acceptable. “It’s an easy sell if you do it right,” he says. Poston believes it’s important to include the technologists not just in day-to-day operations but also in long-term planning and decisions. McLeod Regional recently acquired Toshiba’s Aquilion ONE CT scanner for its emergency department, general radiology, and cardiac exams. Having the Aquilion ONE enables the hospital to participate in Toshiba’s PROTECT program, a three-year, comprehensive CT radiation dose management program that combines technology with education and support to be sure that patients are scanned at the lowest dose possible while still getting diagnostic-quality images. As part of the program, Toshiba’s experts review the system’s hardware and software then consider implementing additional dose reduction technologies. 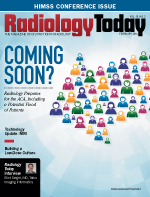 Choosing the right equipment is important for creating a low-dose radiology department, and keeping the technologists informed helps keep staff conscientious, Poston says. To take full advantage of what’s available, it helps when everybody understands why they do what they do, he notes. Involving the technologists also helps them feel free to speak up if they see a patient had the same scan two days ago, Poston says. The technologist can have the radiologist call the referring physician and ask, “Do you really want this patient to have this exam again?” Most referring physicians are receptive to the questions and glad for the gatekeeping, he says. Hentel also believes it’s ultimately important to create a low-dose culture where technologists believe their concerns will be heard and addressed appropriately. They need to feel that the physicians are approachable, and that their input is valuable, he says. Education is another major part of creating a low-dose culture, and it involves not only department staff but also referring physicians and patients. “Everyone in the practice has to be educated about your dose reduction program,” Hentel says. At Weill Cornell, the staff is formally educated about any new technologies or capabilities “and that goes a long way in making full use of our low-dose technologies,” he explains. McLeod Regional holds lunch-and-learn sessions for referring physicians so they are aware of and can take advantage of the facility’s low-dose technology and protocols. The radiology department also has a liaison who visits area medical practices and tells them about McLeod Regional’s low-dose efforts, Poston says. Maintaining a close relationship between the department’s radiologists and the physicians ordering the exams keeps everyone on the same page, with the same low-dose goals, he says. As part of its low-dose efforts, the Weill Cornell radiology department consults with the physicians requesting CT or fluoroscopy exams. “If a study is inappropriate or there’s a safer way to do it, we provide that information to the physician when he’s ordering the study,” Hentel says. Some physicians like to make all their own decisions, and some will gladly defer to radiology to determine the best imaging for a particular clinical question, he says. — Beth W. Orenstein is a freelance medical writer based in Northampton, Pennsylvania. She is a regular contributor to Radiology Today.